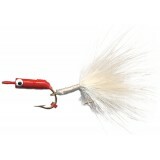 The ORIGINAL Lisk Lure Little Skunk around since 1954 is hand-tied and approximately 1/32 oz. with #8 jig hook and #12 trailer hook with marabou. 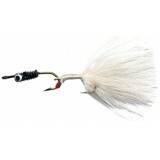 Great for catching for pan fish ‚bluegill, crappie, and small bass, etc. Black Body with White Stripe and Black Tail. 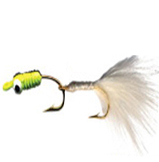 Black Body with White Stripe and Chartreuse Tail. Black Body with White Stripe and White Tail. Chartreuse Body with Black Stripe and Black Tail. 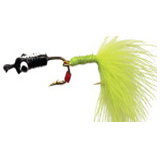 Chartreuse Body with Black Stripe and Chartreuse Tail. Chartreuse with Black Stripe and White Tail. Green Body with Black Stripe and Green Tail. Purple Body with Black Stripe and Purple Tail. Red Body with White Stripe and White Tail. White with Black Stripe and Black Tail. White Body with Black Stripe and White Tail. Yellow Body with Black Stripe and Yellow Tail.